In modern times women had much less involvement in the work of war. A turning point was the Crimean War in the 1850s between Britain, France, and Russia. Wealthy women decided to travel to the Crimea to help with the care of the wounded soldiers. They decided to do this because, for the first time in modem history, accurate and up-to-date information about the terrible conditions of war and the incompetence of the military leaders was reported in newspapers back in England. Things were so bad that some English soldiers had not even been taught how to fire a rifle before they were sent into combat at Sevastopol. Even though the conflict took place in the cold winter of Southern Russia, the British troops were given no warm clothing. Noble women read about these events in newspapers and decided to act. Medical aid for soldiers in the nineteenth century barely existed and most of the deaths in the Crimean war were due to cold, disease, and wounds. 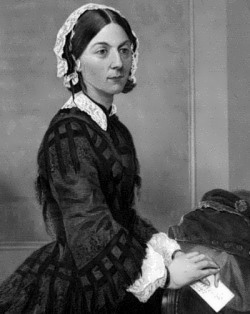 The most famous woman who traveled to Russia was Florence Nightingale. She set up a field hospital in Balaclava. 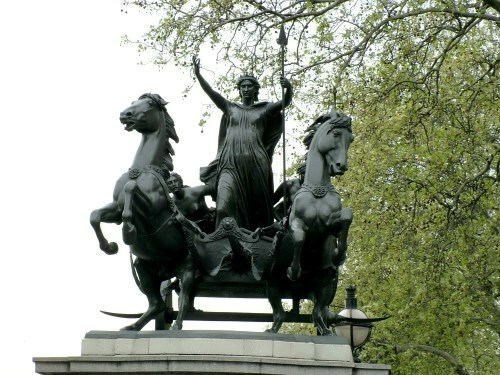 She is the ‘grandmother’ of nursing in the military, known as the ‘lady with the lamp’ to the dying British soldiers. Nightingale was not the only woman to serve her country: Mary Seacole, of mixed Jamaican and British parents, traveled from the Caribbean to Britain to offer her nursing skills. Because of her ethnic origins she was refused an interview by Nightingale’s team. Seacole then decided to travel independently to the Crimea, where she worked just as hard as anyone else for the welfare of the soldiers. The First World War was the first conflict for centuries in which Britain fought for its very survival as a nation. More British soldiers died between 1914-1918 than in the Second World War of 1939-1945. A whole generation of young men was killed. Most families in Britain know of a relative who died in WWI, which is not usually true of WWII. For these reasons British people still call WWI The Great War, and the end of hostilities (11 November 1918) is remembered by everyone, young and old, in special ceremonies every November. 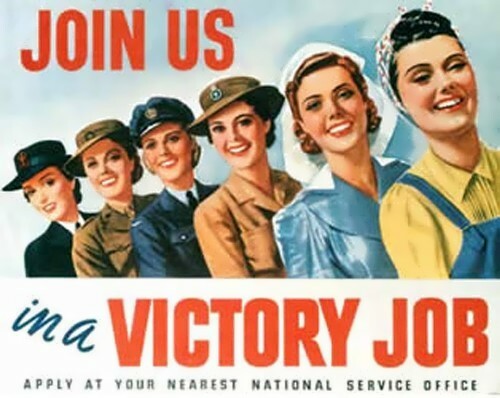 In the Great War, as men went off to fight, women replaced them in the workforce. For the first time many women had the opportunity to do better-paid jobs that only men had been allowed to do before in Britain. Many became bus-conductors and office-workers, a few even became doctors and police officers. A quarter of a million women worked on the land. The biggest change was in war industries. Over 700,000 women worked in factories making weapons and bombs. This was very dangerous work. There was also a particular demand for women to do heavy work such as unloading coal and building ships. • The only country in the First World War to use women troops in combat was Russia. 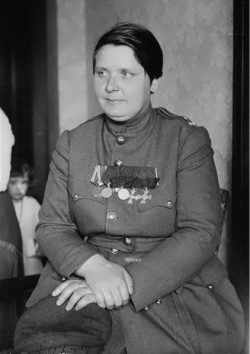 Maria Bochkareva joined a regular army unit and later formed a Women’s Death Battalion of 2000 troops. She was wounded twice and won three medals for her bravery. • Women were the only soldiers left to defend the Provisional Government in the Winter Palace in October 1917. Partly due to their efforts during the war British women finally were allowed to vote in elections after 1918. They had helped defeat Germany and saved Britain. What would their role be in the next World War? In 1939 Britain declared war on Fascist Germany after Hitler had invaded Poland. Soon Britain stood alone in Europe against the Nazis. Women once again were needed to save Britain. As in the First World War women were called upon to work in all areas of the so-called ‘Home Front’. Because Britain was an island surrounded by German troops and ships there was a real risk of blockade and starvation. 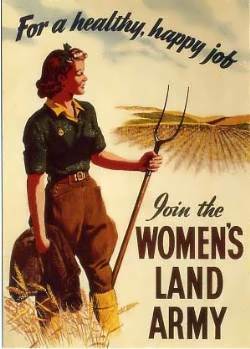 Many women worked hard as ‘Land Girls’ doing heavy physical work in agriculture. One new агеа of female activity in war was in espionage. The Special Operations Executive used many women as secret agents. One of these women was Vera Atkins. Her job was to create ‘cover-stories’ for the spies sent into occupied Europe. 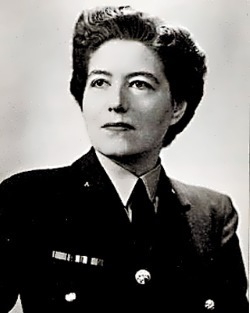 She sent 39 women spies into enemy territory and also spent a year interrogating German officers after the war. Many women special agents worked as radio operators in France, decoding messages sent by the British to help the French Resistance movement. This was very dangerous work indeed as the chances of being caught were very high. They parachuted into the country at night, quickly moving from place to place to avoid detection. They transported messages around the country and helped supply the Resistance with weapons and ammunition, which was being dropped by the Royal Air Force. 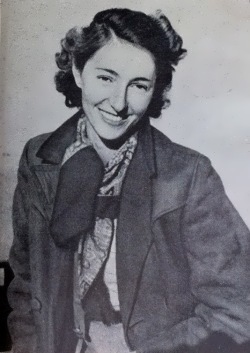 Another woman spy, Christine Granville, who was born in Poland, collected information on troop movements and helped Churchill correctly predict the invasion of the Soviet Union by Germany. 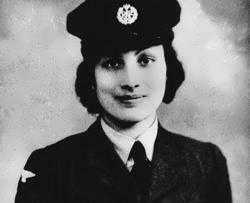 Noor Inayat Khan was born in Moscow in 1915. During the war she worked as a British spy in France, staying in the country even when she knew that the Germans would eventually arrest her. When she was arrested, she gave no information to the Germans. However, they were able to break the code in the book she was carrying. After this they could understand the messages London was sending to France and more British spies were caught. Like many women spies, the Germans murdered her. 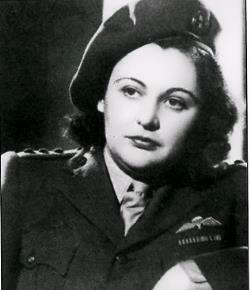 In 1949 she was posthumously awarded the George Cross for bravery. Women made many other contributions to the British war effort, in fire fighting, journalism, and operating anti-aircraft guns. They also led the way in criticizing the way the war was being fought: some women journalists argued that the mass destruction of German cities by bombers was morally wrong. Recently women have been able to join the army, navy and air force. Unlike in America, though they are still not allowed to fight alongside men. A government report in 2002 said that if women were allowed to fight, then the ‘combat effectiveness’ of the army would be less. No one really understands what this means. Some people think that if women fought along-side men, then the men would worry too much about the women, and so put themselves in danger. The report gave lots of reasons why women should not fight. Many of the reasons were about physical and psychological differences between men and women. What is interesting is that women in America fought for years next to men on the front line. In Iraq and Panama they showed everyone was very brave and often better at fighting than the men. However, the British army is different from the American army in an important way. British soldiers are still trained to kill the enemy with hand-to-hand weapons. This means face-to- face, with ‘cold steel’. Many people still believe that this kind of fighting would be very difficult for women. Что делать женщинам, когда их мужчины идут на войну? Исторически ответ был: «оставаться дома и присматривать за домом, землей, и детьми», хотя в древней Британии женщины часто сопровождали мужское население на поле боя, а иногда даже принимали участие в боевых действиях (в дохристианской Британии даже был успешный полководец, королева Боудикка, которой почти удалось оттеснить римлян из Британии). В наше время женщины гораздо меньше вовлечены в войны. Поворотным моментом была Крымская война в 1850 между Англией, Францией и Россией. Богатые женщины решили поехать в Крым, чтобы помочь ухаживать за ранеными солдатами. Они решили сделать это, потому что, в первый раз в современной истории, точная и актуальная информация о страшных условиях войны и некомпетентности военачальников сообщалась в газетах в Англии. Все было настолько плохо, что некоторых английских солдат даже не учили, как стрелять из винтовки, прежде чем они были отправлены в бой в Севастополе. Несмотря на то, что конфликт проходил в условиях холодной зимы Юга России, британским войскам не дали теплую одежду. Благородные женщины прочитали об этих событиях в газетах, и решил действовать. Медицинской помощи для солдат в девятнадцатом веке практически не существовало, и большинство смертей в Крымской войне были из-за холода, болезней и ран. Самая известная женщина, которая ездила в Россию была Флоренс Найтингейл. Она создала полевой госпиталь в Балаклаве. Она является «бабушкой» медицинской помощи в армии, известная как «леди с лампой» для умирающих британских солдат. Найтингейл не была единственной женщиной, служившей своей стране, Мэри Сикоул, от смешанных ямайских и британских родителей, приехала из Карибского бассейна в Великобританию, чтобы предложить свои медицинские навыки. Из-за ее этнического происхождения ей было отказано командой Найтингейл. Сикоул решила самостоятельно поехать в Крым, где она работала так же тяжело, как и все остальные на благо солдат. Первая мировая война была первым конфликтом на протяжении веков, в котором Британия боролись за свое выживание как нации. В 1914-1918 годы умерло больше британских солдат, чем в годы Второй мировой войны 1939-1945. Было убито целое поколение молодых мужчин. Большинство семей в Британии знают родственника, который умер в Первой мировой войне, что обычно не так в отношении Второй мировой войны. По этим причинам британцы до сих пор называют Первую мировую войну Великой войной, и конец военных действий (11 ноября 1918) вспоминается каждым, молодым и старым, на ежегодной церемонии в ноябре. Во время Великой войны, когда мужчины пошли воевать, женщины заменили их на рынке труда. Впервые многие женщины имели возможность выполнять более высокооплачиваемую работу, которая до этого в Британии была доступна только мужчинам. Многие стали кондукторами в автобусах и офисными работниками, а некоторые даже стали врачами и полицейскими. Четверть миллиона женщин работали на полях. Самое большое изменение было в военной промышленности. Более 700 000 женщин работали на заводах, изготавливающих оружие и бомбы. Это была очень опасная работа. Был также спрос на женщин, для выполнения тяжелой работы, например, разгрузка угля и строительство судов. • Единственная страна в годы Первой мировой войны, использовавшая женские войска в бою была Россия. Мария Бочкарева присоединились к регулярным войскам, а затем сформировала Женский батальон смерти, состоящий из 2000 отрядов. Она была дважды ранена и получила три медали за храбрость. • Женщины были единственными солдатами оставленными защищать Временное правительство в Зимнем дворце в октябре 1917 года. 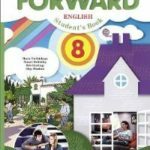 Частично из-за их усилий во время войны британским женщинам, наконец, разрешили голосовать на выборах после 1918 года. Они помогли победить Германию и спасти Великобританию. Какова же их роль будет в следующей мировой войне? В 1939 году Великобритания объявила войну фашистской Германии после того как Гитлер вторгся в Польшу. Вскоре Великобритания одна в Европе противостояла нацистам. Женщины вновь были необходимы, чтобы спасти Британию. Как и в Первой мировой войне женщины были призваны работать во всех областях так называемого «тыла». Из-за того что Великобритания – это остров, окруженный немецкими войсками и кораблями, существовала реальная опасность блокады и голода. Многие женщины трудились как «Земельные девушки», выполняя тяжелую физическую работу в сельском хозяйстве. Новая область женской активности в войне была шпионаж. Управление специальных операций использовало многих женщин в качестве секретных агентов. Одной из этих женщин была Вера Аткинс. Ее работа заключалась в создании историй для шпионов, посланных в оккупированную Европу. Она послала 39 женщин шпионов на вражескую территорию, а также провела год, допрашиваемая немецкими офицерами после войны. Многие женщины — специальные агенты работали радистами во Франции, декодируя сообщения, отправленные англичанами, чтобы помочь французскому движению Сопротивления. Это была очень опасная работа, так как шансы быть пойманным были очень высоки. Они прыгали ночью с парашютом, чтобы пробраться в страну, быстро переходя с места на место, чтобы избежать обнаружения. Они перевозили сообщения по всей стране и помогали снабжать сопротивление боеприпасами и оружием, которые сбрасывались королевскими ВВС. Одна женщина, Нэнси Уэйк, из Новой Зеландии, даже провела налет на немецкую тайную полицию. 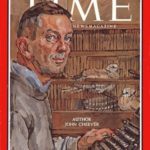 Один из ее товарищей-мужчин сказал: «Она самая женственная женщина, которую я знаю, пока не начнется бой. Тогда она, словно пять мужчин». Другая женщина шпион, Кристина Гранвиль, которая родилась в Польше, собирала информацию о передвижениях войск и помогла Черчиллю правильно предсказать вторжение Германии на территорию Советского Союза. Нур Инаят Хан родилась в Москве в 1915 году. Во время войны она работала в качестве британского шпиона во Франции, оставаясь в стране, даже когда она знала, что немцы в конечном итоге арестуют ее. Когда она была арестована, она не дала никакой информации немцам. 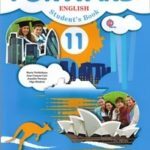 Тем не менее, они смогли раскодировать книгу, которую она несла. После этого они смогли понимать сообщения, которые Лондон отправлял во Францию, и было поймано много британских шпионов. Как и многих женщин шпионов, немцы убили ее. В 1949 году она была посмертно награждена Георгиевским крестом за храбрость. Женщины сделали много других вкладов в британские военные усилия – тушение пожаров, журналистика, обслуживание зенитных орудий. Они также подвергли критике ведение войны: некоторые женщины-журналисты утверждали, что массовое уничтожение немецких городов бомбардировщиками было аморально. Недавно женщины смогли присоединиться к армии, флоту и военно-воздушным силам. В отличие от Америки, где им по-прежнему не позволялось воевать наравне с мужчинами. Отчет правительства в 2002 году гласил, что если бы женщинам разрешили сражаться, то «боевая эффективность» армии была бы меньше. Никто не понимает, что это значит. Некоторые люди думают, что если бы женщины боролись бок о бок с мужчинами, то мужчины бы слишком беспокоились о женщинах, и тем самым подвергали бы себя опасности. В докладе было перечислено много причин, почему женщины не должны сражаться. Многие из причин были о физических и психологических различиях между мужчинами и женщинами. Интересно то, что женщины в Америке сражались в течение многих лет рядом с мужчинами на линии фронта. В Ираке и Панаме они показали, что каждая была очень храброй и часто лучше сражались, чем мужчины. Тем не менее, британская армия отличается от американской армии в важном направлении. 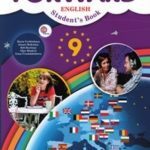 Британские солдаты все еще обучаются убивать врага с оружием в руках. Это означает, лицом к лицу, с «холодной сталью». Многие до сих пор считают, что этот вид сражения был бы очень труден для женщин.